Threaded Line Vacs: Low Cost Conveyor Uses Ordinary Pipe! EXAIR’s Threaded Line Vac air operated conveyor takes an ordinary pipe and converts it into a powerful conveying system. A fast, low cost way to convey items such as pellets, scrap trim, bulk solids, chips, paper, small parts, sawdust, granules, and so much more. The Threaded Line Vac attached easily to plumbing pipe couplers, like PVC or iron, making it easy to build a complete system with parts readily available from your local supply house or hardware store. The Threaded Line Vac are ideally suited for conveying large volumes of materials over long distances. Like the standard, smooth bore ended Line Vacs, the unit works by ejecting a small amount of compressed air to produce a vacuum suction on the inlet side and a high output flow from the outlet side. By using a pressure regulator to control the compressed air supply pressure, the rate of conveyance can be controlled to match the application needs, while minimizing the compressed air usage. Models are available from 3/8 NPT to 3 NPT with materials of construction of aluminum and types 313 and 316 stainless steels (excellent corrosion resistance.) High temperature versions of the stainless steel Threaded Line Vacs are available as well, for temperatures up to 900°F. For those processes requiring the highest rates of conveyance over the longest distances and/or the most abrasive of materials, the Heavy Duty Threaded Line Vac is the right choice. Designed with the most rugged industrial processes and applications in mind, the special hardened alloy construction helps prevent premature wear that could occur with standard aluminum or stainless steel models, under the harshest of conditions. The performance has been boosted, to be able to convey more material, over longer distances and higher vertical rises. For another look, please see the video available that provides more details about the Line Vac family. If you would like to talk about Line Vacs or any of the EXAIR Intelligent Compressed Air® Products, feel free to contact EXAIR and myself or one of our Application Engineers can help you determine the best solution. A textbook application for vacuum generators is the ‘pick and place’ function. With ever increasing automation and robotic cells, more and more opportunities present themselves to utilize the E-Vac Vacuum Generator as a part of the system to ‘pick up’ an object and ‘place’ it in a new position. But the E-Vac’s can be used for many more types of applications. Another popular usage is to hold something in place. One of our customers uses an array of Adjustable E-Vacs to pull a vacuum and hold down various sizes of Styrofoam sheets during a machining operation. The previous system was a 1 hp blower type, and did not offer any flexibility for handling different size sheets. Sheets would slip and produce off quality results. After installing the new design, the system was able to handle any size sheet, and scrap levels went down dramatically. A unique implication that was solved with an E-Vac was to deflate sporting balls. The customer printed custom logos, and preferred the items to be flat for the printing operation. Using a commercial grade electric shop vac didn’t completely deflate the balls, and motors burned out often. Using a low vacuum In-Line E-Vac with a quiet Straight Through Muffler, the customer can now quickly and quietly, fully deflate the balls. Another popular use for the E-Vac is to pull a vacuum for drawing up liquids or gases. A customer that manufactures automotive seats was having issues with the process, where the expanding foam was producing a gas, and the gas would produce pockets and voids in the foam after setting. The customer used a model 800017 In-Line E-Vac to create a vacuum inside the mold and draw off the gas, eliminating the pockets and the voids in the final product. Lastly, as I am big fan of recycling, anything and everything, we worked with a customer that recycles the old CRT style of computer monitor (remember those?) The housing would be sawed in half, so that access to the internal components could be made. Because of the variability in the size and shape of the monitors, the customer was using an adjustable chuck system, which took time to set-up for every monitor, each being a bit different. To speed up the process, an EXAIR In-Line E-Vac and 5″ Suction Cup was implemented, and the monitor held in place by the screen, which was was very consistent in shape from monitor to monitor. This change reduced the set-up time required. These and other Applications for the E-VACs and all other EXAIR products can be found on the EXAIR website on the Products page, under the Related Info section toward the bottom of each page. If you have questions regarding E-Vac Vacuum Generators or any EXAIR Intelligent Compressed Air® Product, feel free to contact EXAIR and myself or one of our Application Engineers can help you determine the best solution. A couple weeks ago I wrote a blog titled, Spring Cleaning All Around, outlining just a few of the many features of our Industrial Housekeeping Products. All of these products are compressed air operated, have no moving parts and require no electricity, making them a safe and virtually maintenance free option for industrial clean up. We are currently running a promotional offer, where if you purchase one of these products by May 31, 2015, we will include a FREE Vac-U-Gun, a $98 Value!!! (Use the promotional model number within the promo to receive the offer). The Vac-u-Gun can be used as a blow gun, vacuum or for product transfer. Using only 13 SCFM @ 80 PSIG of compressed air, the unit produces a high output airflow on one end and creates a vacuum on the other end. In blow off mode, the unit provides 9 ounces of high velocity, forceful airflow. By changing the orientation of the nozzle insert, the unit can be converted into vacuum mode, producing -29.5″ H20 vacuum, use the bag attachment for general clean up. The output end can be connected to an 1-1/4″ smooth bore hose, allowing for the transferring of dry media. Again, there are no moving parts or electricity required to operate, so you get the convenience of 3 separate tools all in one single, safe hand held device! 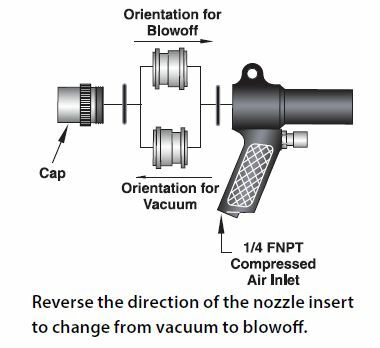 Simply change the nozzle insert orientation to quickly change between blowoff mode or vacuum mode. Of course, if you need any assistance with selecting the right Industrial Housekeeping Product, you can always contact an application engineer.